Well, Ryan and I had our very first ultrasound this past Friday! I’ll admit that I was pretty freaking nervous for it, simply because I had this innate fear that something was wrong. and we got to see our little peanut on the screen for the first time ever. Here’s the tricky part though (and it’s the main reason we went in for the ultrasound). Ryan and I conceived on birth control, which makes it tricky to predict an actual due date. Case in point? 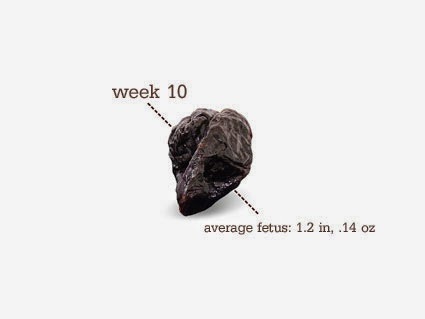 Based on the dates (last cycle, etc), I’m 11.5 weeks right now. However, our little baby is measuring small at only 10 weeks today. So, the ultrasound tech told us in cases like this, they go solely off the measurements of the baby. So, we basically just went back in time 1.5 weeks. with morning sickness, it feels like an eternity of extra time until the second trimester! but the tech made sure to inform me that this could change if the baby catches up in size. Regardless, we were just excited to actually see and get a visual (and audio) confirmation of our baby’s health! The baby has a high heart rate of 163 beats per minute, which they said is high but strong. he/she was all huddled in the right corner, hiding out, and it made those cramps a whole lot more understandable. and he won’t be around for any of the ultrasounds until the very end. and hoping that this little nugget knows that all it has to do is grow!